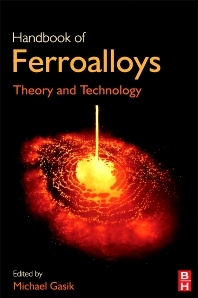 This handbook gathers, reviews and concisely presents the core principles and varied technology involved in processing ferroalloys. Background content in thermodynamics, kinetics, heat and mass transfer is accompanied by an overview of electrical furnaces theory and practice as well as sustainability issues. The work includes detailed coverage of the major technologies of ferrosilicon, ferronickel, ferromolybdenum, ferrotungsten, ferrovanadium, ferromanganese and lesser known minor ferroalloys. Distilling the results of many years' experience in ferroalloys, Michael Gasik has assembled contributions from the worlds' foremost experts. The work is therefore a unique source for scientists, engineers and university students, exploring in depth an area which is one of the most versatile and increasingly used fields within modern metallurgy. All-in-one source for the major ferroalloys and their metallurgical processing technologies, cutting research time otherwise spent digging through old handbooks or review articles. In-depth discussion of the C, Si, Al-reduction, groups II-VIII of the periodic table, supporting analysis of metallurgical processing. Contemporary coverage includes environment and energy saving issues.